If you are trying to target big fish without spending weeks on the ocean, Inshore fishing is for you. Charleston, SC is located near productive estuaries that act as hotbeds for a variety of species. Not sure what inshore fishing is? Keep reading to find out more. How Deep is the Water for Inshore Fishing? A simple answer marks 30 meters (98 feet) as the limit for inshore fishing but we call inshore anything close to shore. Usually we are fishing right on the marsh. Water close to shore is flatter and generally protected from the big winds and storms of the open ocean. This makes fishing accessible with smaller boats, affording a friendly atmosphere. This style of fishing includes creek fishing and shallow water. Fisherman target shallow mudflats and areas around beaches to find good fishing. What Kind of Fishing Gear is Needed? Lacking the extreme depths of deep sea fishing, tackle is similar to freshwater fishing. Relatively light line and spinning reels are the most common tools for inshore fisherman. Redfish, in particular, are targeted with line featuring 10-15lb test. The rods are between 6-7 feet, easy to cast and work in the shallow water. The castable gear makes using artificial baits possible. This means, there is more of a sporting element to the fishing, which has grown in popularity in recent years. For larger fish, such as Cobia and Tarpon, larger rods are used. These are around 7- 71/2 feet long and are able to lift heavier loads and paired with stronger line. Heavier gear lets you cast bigger baits for bigger fish. Jigheads with Soft Plastics baits on them are always a good lure to throw. ZMan MinnowZ Paddle Tails is a popular choice among fishermen when fishing artificial. Large plugs, spoons are also used to target more aggressive fish. When throwing artificials in clear and shallow water, it’s imperative to not spook the fish. Cast over them and then bring the bait near them. Also, Cast up current and bring your bait down with the current as the fish will be facing upstream waiting for bait to come down river. Live bait fishing incorporates the bait the fish are eating. From crabs to baitfish, local fishing charters will know what to use. A simple hook, sinker, and float are used to suspend live bait in the water column where fish are feeding. Can You Catch Trophies Inshore Fishing? Oh yes, especially near Charleston, SC. 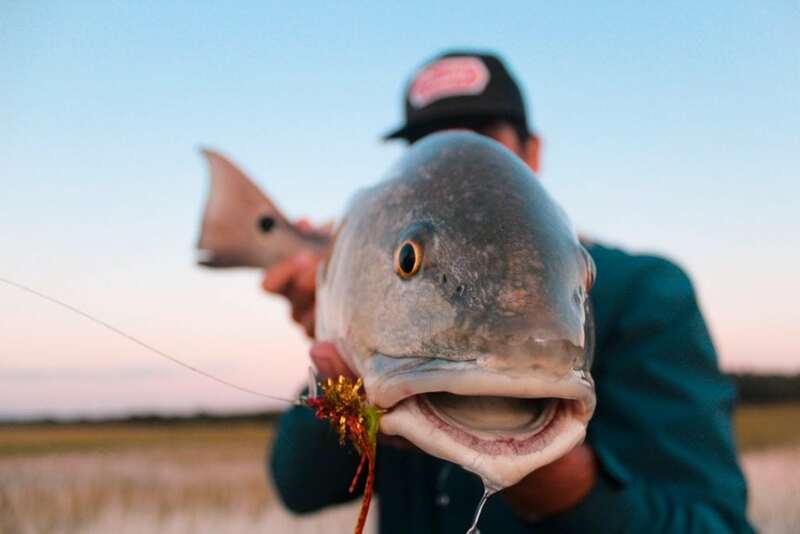 Bull Redfish can be found, reaching sizes of 50lbs or more! Summer/Fall provides the best opportunity for catching the biggest fish. Baitfish abound and the big breeders are moving between deep and shallow water. Other large fish such sharks are prevalent in the waters. Some species can reach 250lbs, requiring extremely heavy gear to bring them in. There is nothing like hooking a giant shark on your line. Hard fighters- a good day shark fishing is always rewarding. If inshore fishing sounds like fun, that’s because it is. Contact RedFin Charters today and schedule a fishing trip.